Contour a natural surface from a job supplied. Identify where the model fails to accurately represent a creek through the surface. Define discontinuity or breakline strings along the creek. Re-contour the surface to incorporate the discontinuities. Start CDS in your usual fashion, either from the Start Programs list, or from a shortcut if you have one set up on your desktop. Use the File, Open command to open job EX3 in your \Foresoft\cds2\Tutor folder. The screen should appear as below left, and you should maximise the window to fill the screen so you have a display as seen below right. 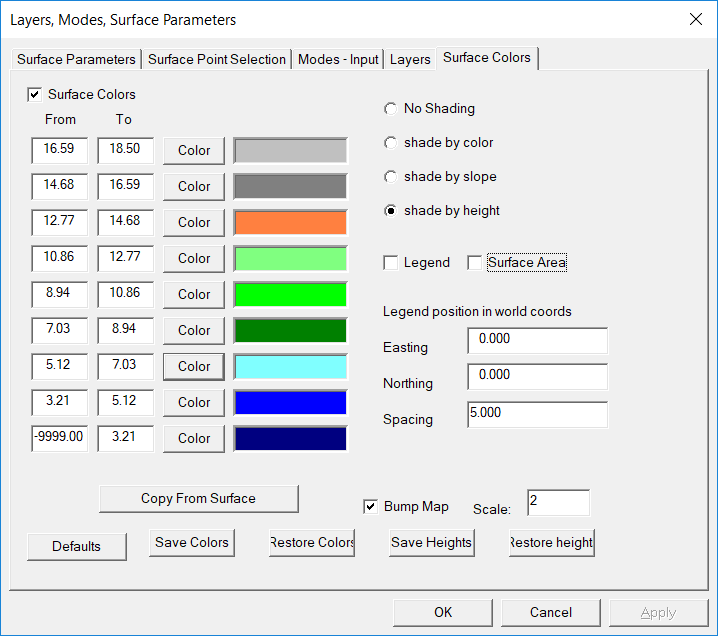 Now pull down the Contour Menu and select Surface Parameters to see the screen on top of the next page. For our purposes the majority of the default values will be sufficient, however you should change the Contour interval so you have a Major Interval of 2.0 and a Minor Interval of 0.5. This will give you a clearer picture of the surface. Once the changes are made, select OK .
Next you should pull down the Contour Menu and select the Form model option. 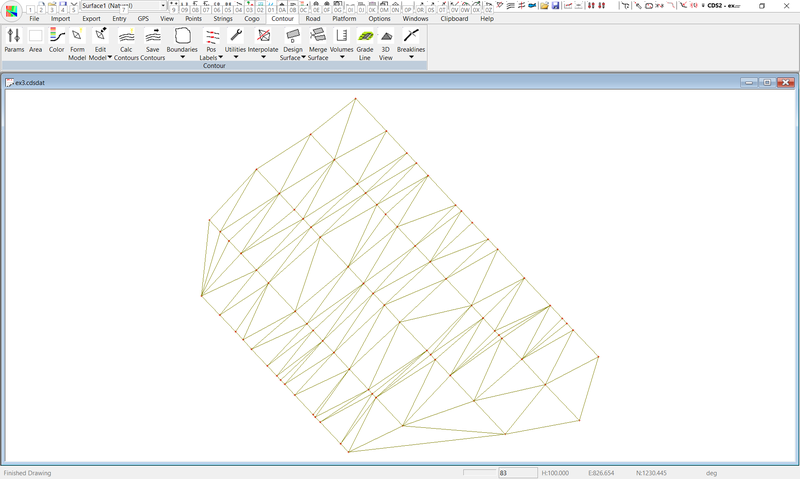 The triangles will be quickly formed and the screen should appear as below. 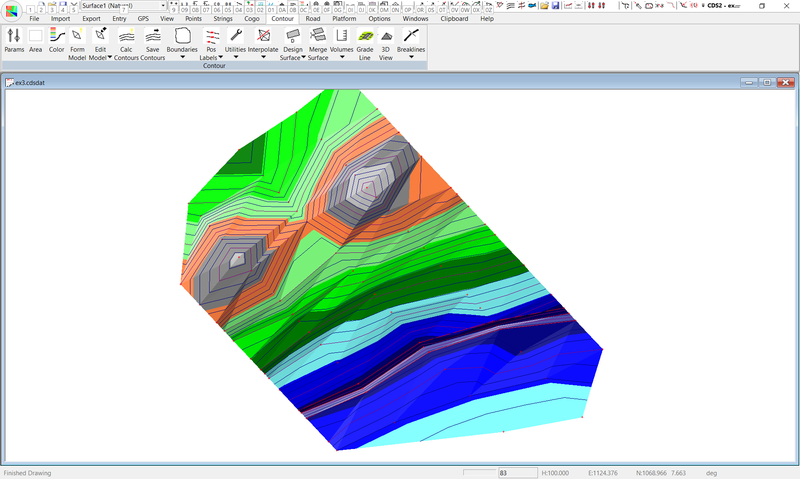 Now pull down the Contour menu again, and select Calculate Contours, and when asked you should save the contours that have been formed, and appear as in the screen below right. Now, if you inspect these contours, you will find it difficult to see any creek running across the model, however we can tell you that there should in fact be one. In fact, we have been told by the field party that the creek is defined by the following points. To get a clearer picture of how the model has been formed, Zoom up a window of the approximate size you see in the screen shown below. 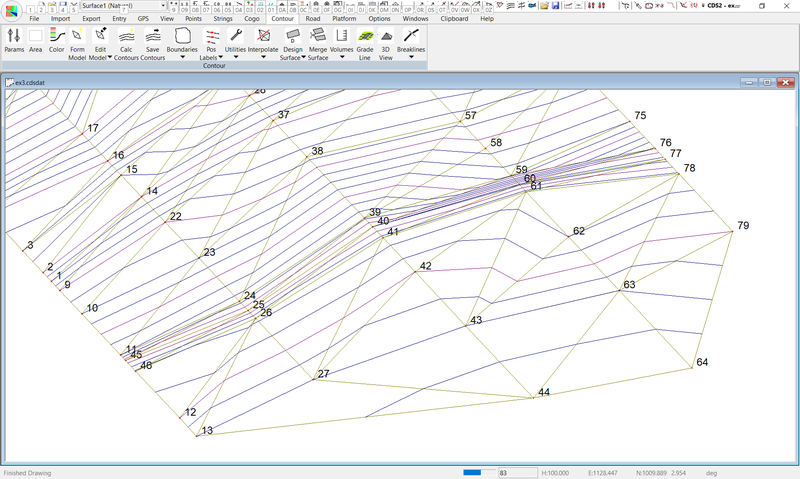 Once the screen is redrawn, you should see a set of contours similar to those in the screen above right, and it is obvious that these contours are not representing a creek, so we need to re-educate the model, and this can be easily achieved by inserting discontinuities or breaklines. Since you are satisfied that the existing contours are a little “odd” you should Zoom Extents so you can see the full job while you add in some strings to represent the creek. In order for the program to take notice of the discontinuities, they need to be placed in a string folder called “DISCON1” where the “1” signifies that these discontinuities are to apply to Surface 1. (Obviously when you get to use Surface 2, you would use a folder named ‘discon2’) In CDS Premium you can also put these strings on a layer and set the breakline option in string attributes. Pull down the Strings menu, and select the Add option. When you select Add, a screen will appear as seen below. Pull down the ‘Folder” name and select ‘discon1’ Now you need to identify the string you are about to enter. Select the field titled “String ID” and type in LB (to signify Left Bank) and press Enter or the Tab key. The cursor will move into the field at the bottom of the “Strings” window, and here you need to define the points that will be connected in this string. From the information above, you should type in 11 followed by a comma (,) and then 24 followed by a comma - you will see a line appear on your screen connecting these two points. Note, that you may either type in the point numbers, or select them with the cursor if you can see them clearly. Once you have entered in point 76 you should select the Apply button to save the string away. Now set the String ID to CL. The list of Points is 45,25,40,60,77 and then select Apply. You should now see two lines across the display indicating the left bank and the centreline of the creek. You should now repeat the process with a String ID of RB and points of 46,26,41,61,78. Select Apply to end this string entry. Then select Finish to close down the Add Strings window. You should be able to see the strings drawn over the contours, but if you wish to get a clearer picture you can turn the contours OFF by either using the Modes screen, or by using the F7 Function Key. Now that the discontinuities have been inserted, it is time to reform the model to incorporate them. 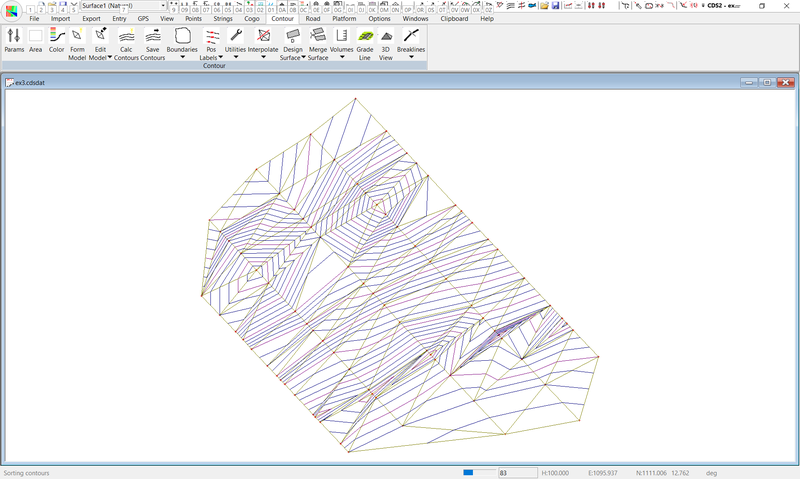 Note: for those of you who have used earlier versions of Foresight Programs, the process has now changed so that you need to re-form the triangles, not merely the contours as was previously the case. 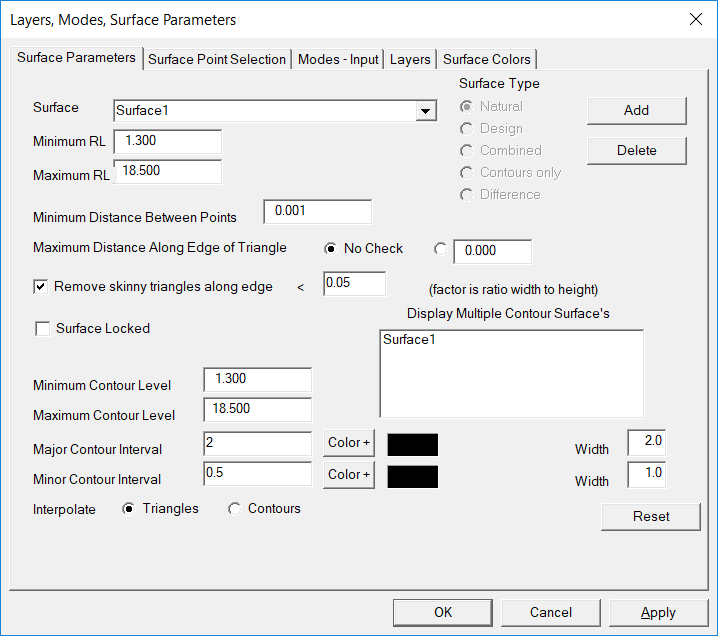 Pull down the Contour menu and select Form Model. 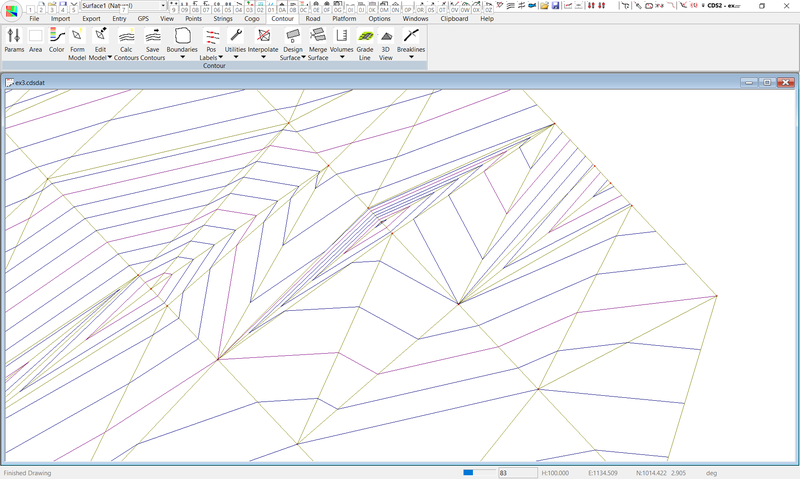 The triangles will form quickly on the screen, and if you pay close attention, once the triangles are completed you will see a small window appear informing you that it is re-organising the triangles to take the discontinuities into effect. Since this process is fairly speedy, and this is a rather small job, if you have the latest souped up Pentium, you may only see a flash as this happens. This process needs no intervention from you and once it is completed the screen will show you the triangle model. Pull down the Contour Menu once more, and this time select Calculate Contours, and save them when the process is finished. The screen should now appear as seen below. It should already be apparent that there is now a creek running through the model. If you wish to Zoom into the window that you used earlier in this tutorial you should now see the creek clearly defined as seen below.